“Proudly produced in a whole bunch of countries” is the tag line that appears on Friendly Fire Pack 9 and it’s a true enough assertion. With designers from Germany, the Netherlands, Switzerland, Australia and Sweden, plus playtesters from those countries and Denmark and the United States, Friendly Fire Pack 9 comes to the ASL community courtesy of a coterie of nationalities, an international collection of people with at least one thing in common: a desire to create interesting and high-quality ASL scenarios. Long-time readers of this website will have had to put up with a considerable amount of waxing eloquent about the merits of Friendly Fire packs and will have to put up with some more in 2014, as Friendly Fire Pack 9 (FF9) certainly maintains the high quality of its predecessors. Released at the Friendly Fire Tournament in Linköping, Sweden, and in the United States at the ASLOK tournament in Cleveland, FF9 saw players in both places eagerly pull out Friendly Fire scenarios to play. 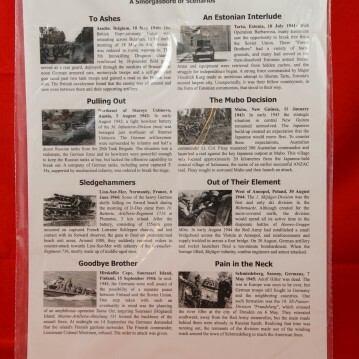 FF9’s 8 scenarios are a mix of actions from across the war, including: Germany 1945 (Soviets vs. Germans), Finland 1944 (Finns vs. Germans), Soviet Union 1941 (Soviets vs. Estonians) and 1942 (Soviets vs. Germans), New Guinea 1943 (Australians vs. Japanese), Belgium 1940 (British vs. Germans), Poland 1944 (Soviets vs. Germans), and France 1944 (British vs. Germans). Standard ASL geoboards used include 16, 23, 33, 36, 40, 41, 47, 50, 62 (2). A number of scenario uses ASLSK geoboards. 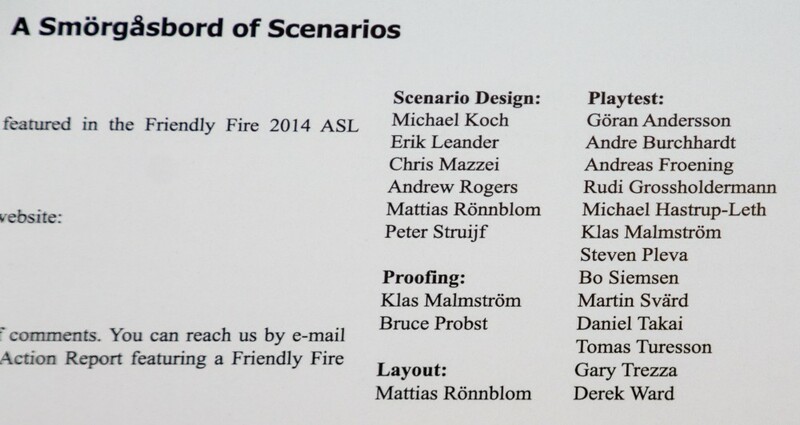 Scenario FrF69 (To Ashes) uses ASLSK board t, while FrF73 (Sledgehammers) uses ASLSK boards p and s. FrF75 (Goodbye Brother) uses ASLSK board x. Scenario FrF71 (Pulling Out) uses geoboard FrFA, as does FrF75 (Goodbye Brother), though neither scenario explains that the board can be found only in Friendly Fire Pack 6. The scenarios are a pretty even mix of small, medium and large actions, though the medium and large scenarios are each on the smaller side of their brackets. No scenarios use Night, OBA, or Air Support rules. FF9 is full of interesting scenarios. One of the more interesting–and challenging–scenarios is FrF76 (Pain in the Neck), which takes place in the final days of World War II in Europe (a la Rally Point 4). In Pain in the Neck, a small force of SS squads (5-4-8s and 4-4-7s) and a handful of vehicles (including two captured Shermans! ), need to exit across a map composed of the woods, hills, and stone buildings of boards 50 and 41. 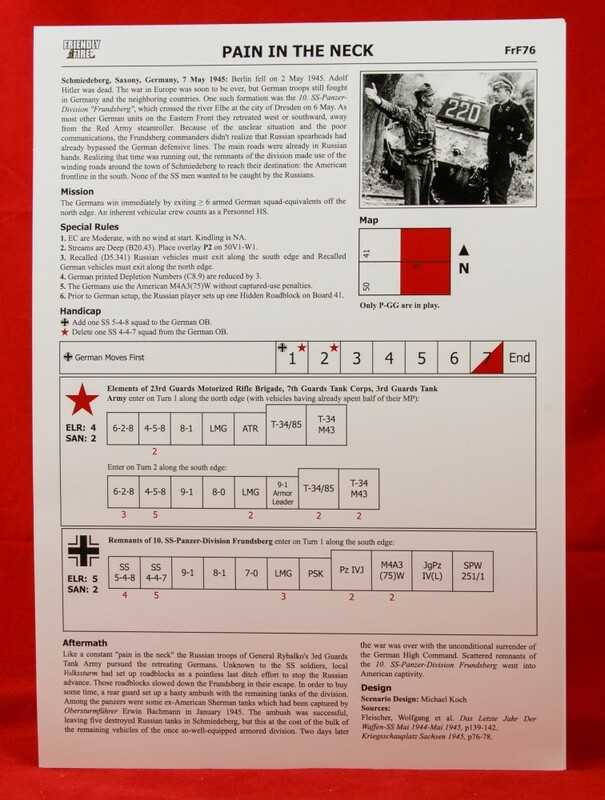 A small Soviet force of 3 squads and 2 tanks come on board opposite them to oppose their escape, while a larger, follow-on force of 8 squads and 4 more tanks comes on board behind the SS to chase them. To win, the Germans must exit 6 squad-equivalents (with inherent vehicle crews counting). The scenario is a very tricky one, especially for the German player, as he must constantly keep his forces moving, while protecting his infantry dearly (as most will need to survive). He has to use his vehicles both to help clear the way as well as to hold up the chasing Soviet forces. The Soviet player, in turn, has to use his tiny blocking force as efficiently as possible, because a mistake could allow the German forces to squirt right past him and off the board. Generally speaking, this is a tough job for the Germans (and early ROAR results certainly reflect this), although some expert-level players contend that with two quality players playing, it is the Soviets who have a bit of a disadvantage. Make of that what you will, but it is certainly a gripping scenario. FrF71 (Pulling Out) is a bad method of birth control but a good notion for a scenario. This scenario also features captured vehicles. It depicts a German artillery position surrounded by a Soviet force (8 squads and 5 T-34s, though they get a few reinforcements later), with a German relief force trying to come to the rescue of their comrades. This German unit contained some captured T-34s, one of which appears in the German OB. 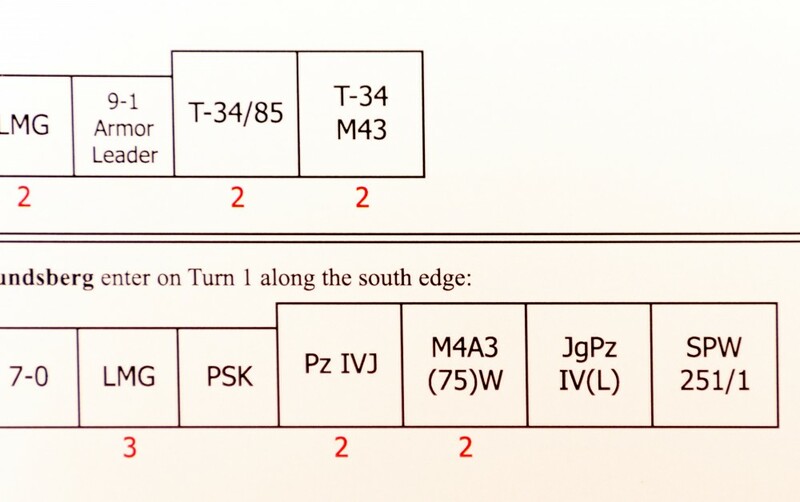 Additionally, two of the Soviet T-34s will turn out (randomly, during the course of play) to be abandoned, with their crews in the same hex. The SSR allows the Germans to use T-34s without captured-use penalties, throwing out the bait for an attempt to capture one or both of the abandoned T-34s, should circumstances allow. FrF75 (Goodbye Brother) features a German “amphibious” assault (using assault boats) against a small but prepared Finnish position. The victory conditions for the Germans are very mild indeed, suggesting that the Finns will cause a lot of damage to the Germans. 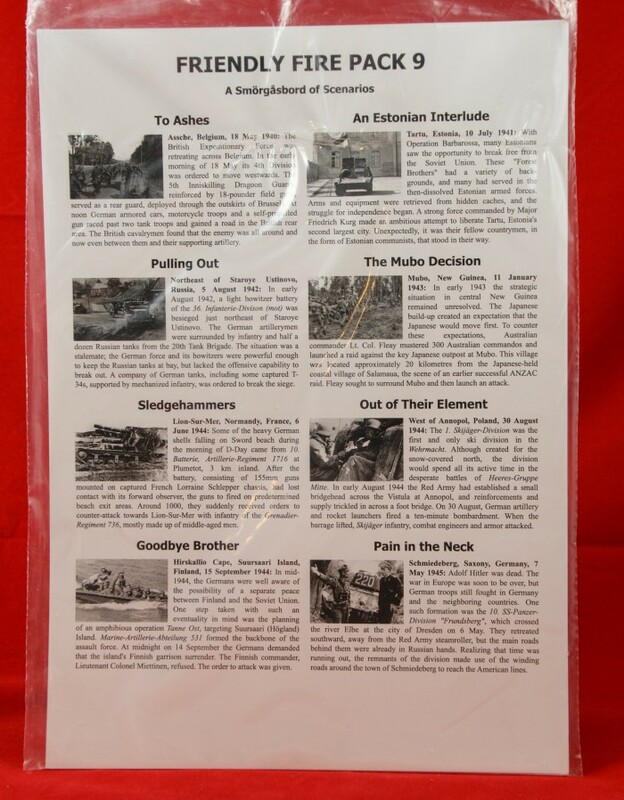 FrF72 (The Mubo Decision) is a PTO action, which one doesn’t see all that much of in the Friendly Fire packs. Set on New Guinea in the Wau area (where an air-supplied Australian force was annoying the Japanese far beyond Allied “front lines”), the scenario features a situation in which both Australians and Japanese have small forces in different areas that must move and fight (though the situation is essentially an Australian attack). It’s a bloody scenario, but fun. FrF70 (An Estonian Interlude) is unusual in that it depicts an “Estonian vs. Estonian” action. In the summer of 1941, as Nazi troops invaded the Soviet Union, Baltic partisan groups formed to revolt against the Soviets. This scenario depicts one such action involving Estonian nationalist partisans under a former army officer, Friedrich Kurg, attacking a Soviet force (consisting primarily of Estonian communists). The historical aftermath does not mention the important role played by these 1941 Baltic partisans in the Holocaust. Even in Estonia, where there were few Jews, Friedrich Kurg ordered the arrest of Estonian Jews and their internment in concentration camps (where they were soon killed). Kurg went on to serve in collaborationist police and military units, eventually fighting for the Germans as part of the Waffen SS. Today, he is sadly considered an Estonian hero. Friendly Fire Pack 9 happily continues its tradition of interesting, well-playtested scenarios–this pack is well worth getting.